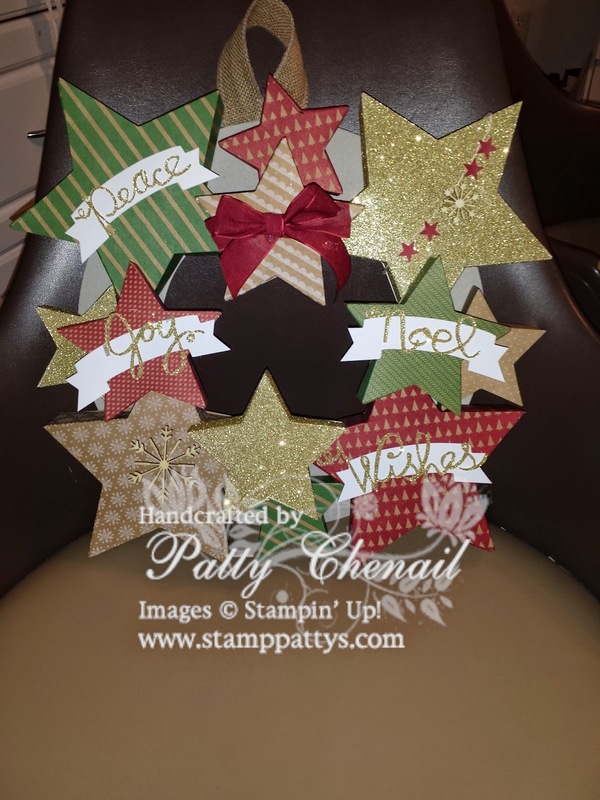 Time for another Stamper’s Dozen Blog Hop! If you are visiting me from Judy’s Blog, thanks for visiting! If you have come here because you are a loyal Stamp-Patty’s follower – I thank you from the bottom of my heart! We have LOTS of holiday inspiration for you this month! Our theme is HAPPY HOLIDAYS! This time of year is my favorite in my Stampin’ Up! business!! The projects that we can create for the holidays are endless! This season, Stampin’ Up! has not only done a standard holiday catalog but also a holiday supplement! I was so thrilled to see more products to beautify my home for the holidays. The problem with catalogs is that they just don’t do the product any justice! How many of you saw all of the stars pictured in the supplement and wondered….”What will I do with those?” Well think no more! The photo above is the exact image shown in the Holiday Supplement. 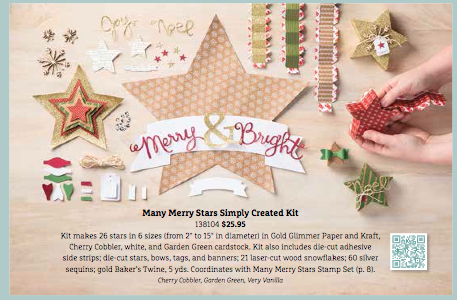 It shows all of the pieces included in the Many Merry Stars Simply Created Kit. What it doesn’t show you is how absolutely beautiful these stars are and more importantly…what to do with them! 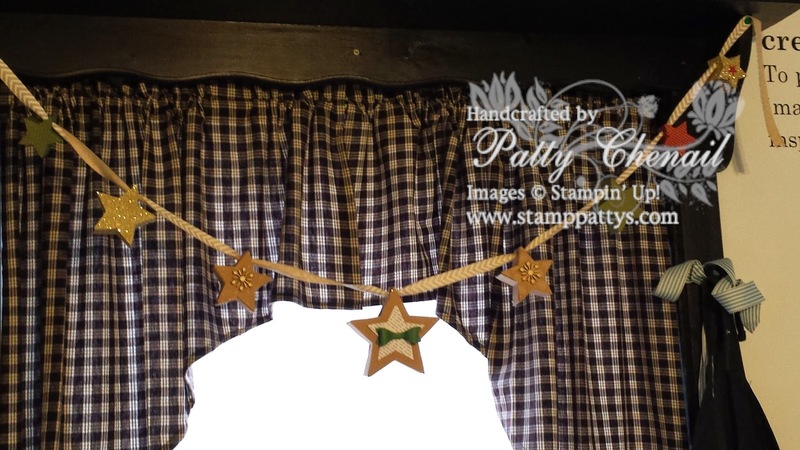 I have to admit, creating this wreath with those stars was very easy to do! I must also admit that even my camera does not take a picture that does this creation justice! I have had it on display in both my stamp studio and my classroom at school and I can not even tell you how many of these kits I have sold! After putting the stars together, I simply used my hot glue gun to adhere them to a circular piece of chipboard to create a wreath! After making the very large star (which I am using for my tree topper), I assembled all of these for the wreath. After doing that, I still had LOTS of extra pieces! I used those pieces and a 4-foot piece of natural chevron ribbon to create the garland pictured below! I couldn’t resist sharing one of my Merry Star Class photos with you all as well as a SU! video to show you just how easy it is to put these together! I hope that I have done my part in inspiring you with the Stampin’ Up! Holiday products! 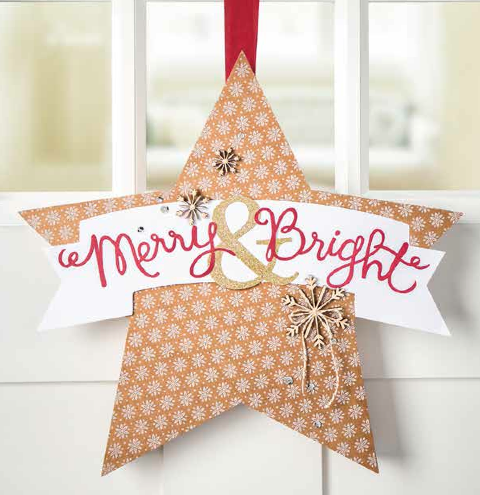 I’d love for you to visit my website and get your order placed for a Merry Star Kit so that you can start creating too! Now hop on over to Lee’s blog to see what she has for you!